'Spirit of Spring' and Other Examples by John Neville Cohen. 'Spirit of Spring' is a well-known study that won much acclaim for the author. This transparency of a portrait was projected over; a second projected colour negative image of a red tulip. 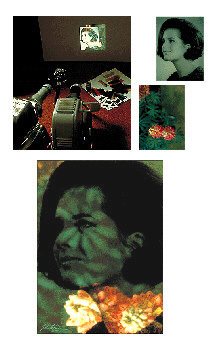 A variation of this concept is plate 59 (Poetic Portfolio) where another profile of Susan was blended with a colour negative of the centre of a tulip. A black and white portrait of the author's sister plate 27 (below) was projected with a colour transparency of some Lupins. For use of the crystal see plates 16, 29 and 50 (Poetic Portfolio). To create plate 16 (page 4) a duplicate transparency was made. This was then projected, with the crystal in front of the lens, and a red piece of cellophane placed behind the slide. The original transparency was then projected into the centre of the pattern formed. The other Spanish flamenco study plate 50 (Poetic Portfolio) was created by the same technique, but two different transparencies were used. Another crystal was placed, behind the lens, but not square on. 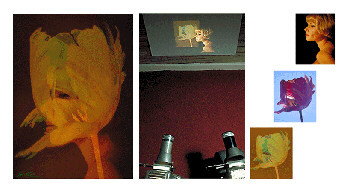 To create the dragonfly study plate 29 (Poetic portfolio) a slide of the Iris leaves was projected upside down, through a crystal in front of the lens. The dragonfly and water lilies were then projected in to the pattern seen. 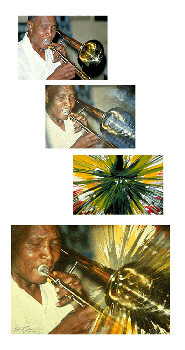 Plate 32 Jazz (below) was created with two projectors, a Cokin camera filter (designed to repeat parts of the image) was placed between the projector lens and the transparency of the trumpet. The colourful transparency of a painting (created by the author) was then projected on to the same screen. No the author is not a painter! This painting was achieved by simply dropping paints on to a revolving board in a drum - at some funfair many years ago.